THE CANADIAN PRESS -- TORONTO - The family of a teen charged with killing a police officer who died after being crushed by a minivan is expressing sorrow at the death, their lawyer said Friday. In addition, lawyer David Berg said the 15-year-old boy appears to have lost the use of his arms and legs due to injuries from the incident that fatally injured York region Const. Garrett Styles. 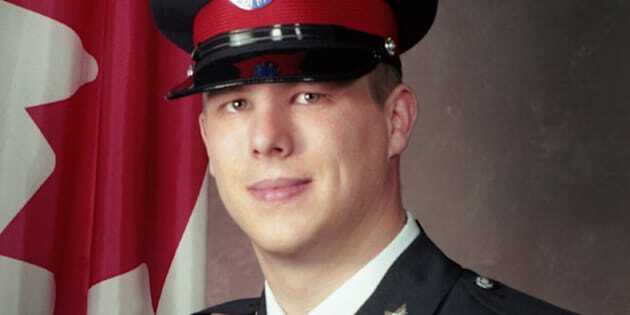 "The family of the young person have asked me to convey... they are deeply saddened by the death of Const. Styles," Berg said in a statement. The teen, who remains in hospital, faces a first-degree murder charge in the June 28 death of the officer. Styles, a married father of two young children, died after being pinned under a minivan police say the youth was driving. After the officer stopped the van in the early hours on a rural road east of Newmarket, Ont., police said it pulled away, dragging him 300 metres before overturning and trapping Styles underneath. The boy was seriously injured in the incident. Berg said he had visited the accused, who cannot be identified, in hospital in Toronto twice this week. "I have not received an official medical report from the hospital as to his injuries," the lawyer said. "(But) I have observed that, at present, he does not have the use of his limbs." The family's expression of sorrow is their first public reaction to the tragic chain of events that cost Styles his life and left the teen with severe injuries. A Facebook profile picture of the boy, a self-portrait taken in a mirror, shows him neatly dressed in a plaid shirt and standing behind a small Canadian flag. The lawyer also said in his statement that the teen was unable to speak at an audio remand on Thursday because of tubes in his throat. Berg said he would have no further comment on the case. Styles' funeral in Newmarket this week drew thousands of uniformed officers and members of the public. At Thursday's remand, the Crown served notice that it would seek an adult sentence if the teen is eventually convicted. The case was put over until Sept. 15 for another telephone remand.